Ave Banana | Warped Factor - Words in the Key of Geek. Tony Fyler remembers a childhood hero who’s also a good source of Potassium. There are some comedy shows which translate around the world in the blink of an eye – Monty Python, Mr Bean. Then there are shows which translate with a bit of panel-beating to make them more user-friendly – Steptoe (Sandford) and Son, Coupling (Moffat!). 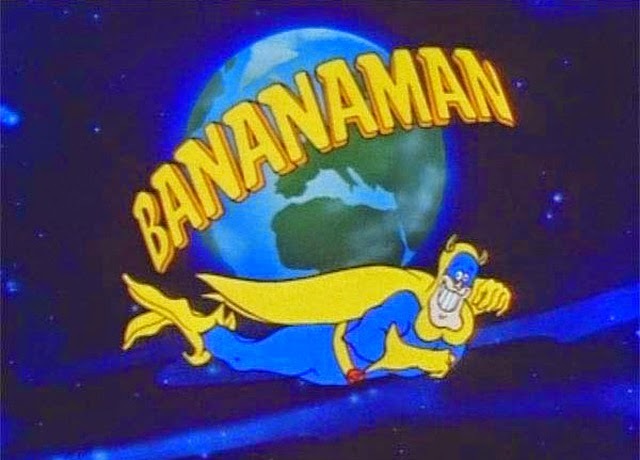 We will apparently get to see whether a particular flavor of 80s, distinctly British, nuttiness will translate around the world, when Bananaman the movie hits screens. As yet, the website for the movie holds nothing but a tease, so it’s probably an opportune moment to take a look back at the blue-and-yellow wunderkind of doolally, rapid-fire silliness, as he was born and ruled his tiny corner of the British psyche. 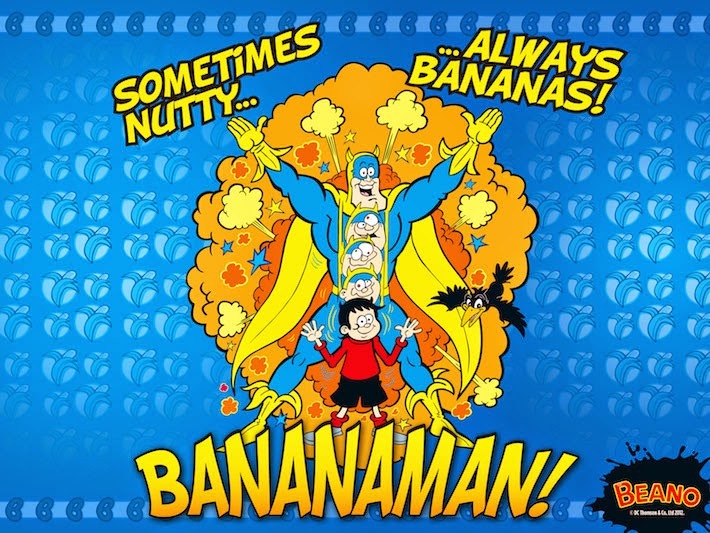 Bananaman was born not, as people frequently assume, in the pages of the Beano or the Dandy, but in the slightly more off-the-wall Nutty comic (the clue’s in the title, really, isn’t it? ), created by Dave Donaldson, developed and mostly written by Steve Bright, and originally drawn by Dave Geering. Right from the word go, there was more to Bananaman than met the eye though – a truly funny cartoon strip that didn’t treat children as stupid or talk down to them, Bananaman’s central idea, a superhero who was both fundamentally useless and whose adventures mocked and satirized those of more straightlaced superheroes going back to the origins of Superman and Batman, was an idea whose time was jussssst about to come. When Bananaman was launched in 1980, Douglas Adams had just begun to feel the effect of his ‘funny science fiction’ concept in The Hitch-Hiker’s Guide To The Galaxy. Rowan Atkinson and Richard Curtis were first delving into ‘funny history’ with The Black Adder, Terry Pratchett was just three years away from publishing The Colour of Magic, the first of his wildly successful ‘funny fantasy’ stories set on the Discworld. And between the first Bananaman stories appearing in the Nutty and their translation into a primetime so-called ‘children’s’ cartoon series on the BBC, the rolling power of Cosgrove Hall, fresh off the likes of Chorlton and the Wheelies (go ahead, sing the theme tune, you know you want to), would take the idea of ‘funny Bond movies’ into the cartoon world with the joyfest that was the original Dangermouse (Sure, why not, go sing that one too). In case you’ve managed to be alive in 2015 and somehow not have encountered him, Bananaman is the superhero alter ego of Eric Wimp (in the comic) or Eric Twinge (on TV), of 29, Acacia Road. When young, nerdy teen Eric eats a banana, he turns into Bananaman – famously with ‘the muscles of twenty men, and the brains of twenty mussels’. Like Hong Kong Phooey before him, he had a sidekick who actually did much of the crime-fighting for him - in Bananaman’s case, a talking crow, called…erm…Crow (a play on Robin, anyone?) - and battled a range of monomaniacal and very silly villains that showed how monomaniacal and very silly actual comic strip supervillains were, often by direct rip off. The Fantastic Four had Doctor Doom, Bananaman had Doctor Gloom; where Bizarro brought the ultimate nemesis of some heroes’ powers, Bananaman had Appleman as his arch-opponent, ‘rotten to the core’; where Superman had Lex Luthor, Bananaman had what or who else but General Blight, a kind of half-Hitler, half-Luthor figure, and so on. The tone was whacky and slapstick, but with a brain behind it making fun not only with wordplay but also by undercutting the very notion that superheroes were necessarily super, and throwing in quite a bit of comic-book parody to boot. It was comedy for comic-reading, clever, quick-witted geeks. Which perhaps explains to some extent what happened next. 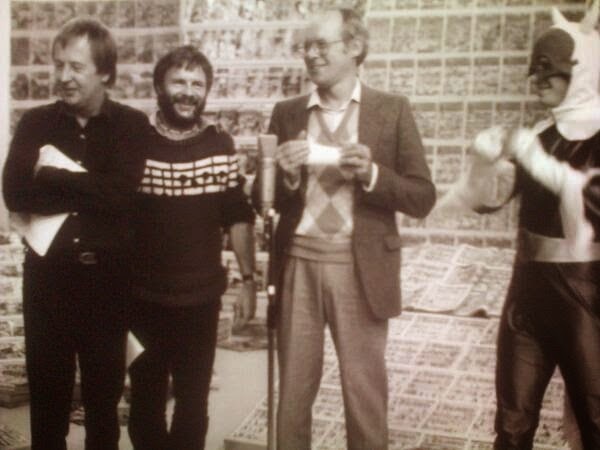 Graeme Garden, Tim Brooke-Taylor and Bill Oddie had always had a reputation of being pitched somewhere between The Monkees and Monty Python – there was surrealistic mayhem in their shows, certainly, but it was all rooted in the idea of them being ‘themselves,’ living together and essentially waiting for the next whacky thing to happen to them. They were however, despite the heavy expectation of a format like that, in the same academic and intellectual league as the Pythons, and in Bananaman, they found a lighter format that allowed them to use their comic and their vocal talents to more consistently witty effect. 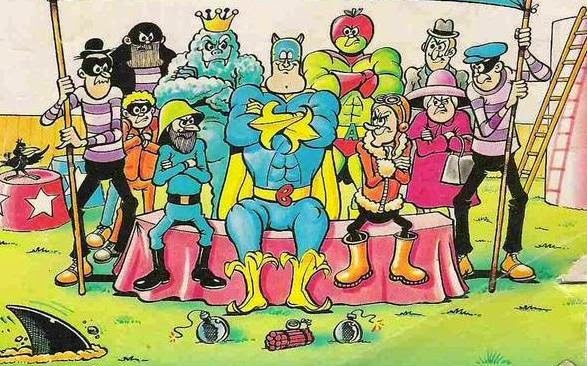 Brooke-Taylor gave a squeaky likeability to Eric, Garden’s relatively booming, smug-mode, upper class certainty was perfect for the transformed Bananaman, while Oddie’s down-to-earth ‘everyman’ voice gave Crow the kind of ‘wink-to-the-audience’ smarts that aimed it squarely at the comicbook-reading kids that would get the smart-alec tone and were more likely to identify with Crow’s observational, figure-it-out methods than the Big B’s bulging muscles. There’s a sense in which Bananaman was aimed at the proto-Buffy audience, and that audience lapped it up. Interestingly, while it went on to be a hit in Australia (a market long noted for the dryness of its wit), it fell notably short of the success that, for instance, Dangermouse has in the States despite similar premises. Perhaps the idea of the American audience liking winners, and the Brit audience preferring – especially in comedy – its protagonists to be losers, or at least a bit useless, comes into play here: Dangermouse, for all the comic ineptitude in his world, at least comes across as a real hero, compared to Bananaman’s clueless klutz. The world, but most especially the imaginations of a generation of British youngsters, was marinated in banana-flavoured silliness for three series, a round 40 episodes in total, sealing Bananaman’s combination of wit, winking and paradigm-inverting humour into the collective memories that would go on to pepper the 90s and early 21st century with witty, upside-down and back-to-front takes on anything geeky that was popular – from vampires to zombies to demons, oh my. Bananaman was part of that movement of sacred cow-slaughtering that stopped geeks taking themselves and their obsessions too seriously (yes, really – imagine what we’d be like without a sense of humour!). 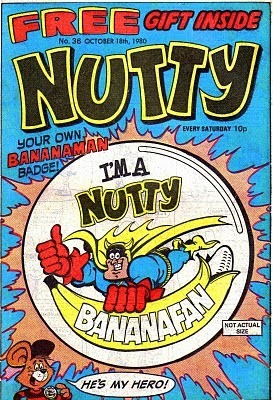 But that was by no means the end – Bananaman went back to two dimensions as though nothing had happened, and continued to expand his own comic universe – the strip still runs in the digital version of The Dandy and the print version of The Beano, proving that Bananaman, like Dennis the Menace, Minnie the Minx and the Bash Street Kids, has truly superhuman staying power in the comic-book world. And so we turn our eyes to the future, and the mooted Bananaman movie. As we said at the start, the website of the movie currently holds just a tease – no news of casting, premise, storyboards etc has yet been released. So – geeks of a certain age and a sarcastic, banana- shaped sense of humour – who would be your ideal 21st century Bananaman? Who would your choice be to direct the Bananamovie? What should the Big Bananabad be? And – more seriously – how should Bananaman be revamped to ensure it stays true to the original, and yet works for a broader, worldwide audience.